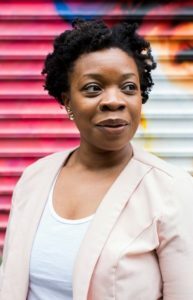 MFONISO UDOFIA, a first-generation Nigerian-American storyteller and educator, attended Wellesley College, obtained her MFA from the American Conservatory Theater [ACT] and, while at ACT, co-pioneered, The Nia Project, which provided artistic outlets for youth residing in Bayview/Huntspoint. Productions of her plays Sojourners, runboyrun, and Her Portmanteau have been seen at New York Theatre Workshop, Playwrights Realm, Magic Theater, National Black Theatre, Strand Theater Company, and Boston Court. She’s the recipient of the 2017 Helen Merrill Playwright Award, the 2017-18 McKnight National Residency and Commission at The Playwrights’ Center and is a member of New Dramatists. Mfoniso’s currently commissioned by Oregon Shakespeare Festival [OSF], Hartford Stage, Denver Center, ACT, and South Coast Repertory. Her plays have been developed by Manhattan Theatre Club, ACT, McCarter Theatre, OSF, New Dramatists, PCS’s JAW Festival, Berkeley Rep’s Ground Floor, The OCC, Hedgebrook, Sundance Theatre Lab, Space on Ryder Farm, Page 73, New Black Fest, Rising Circle and more.